Miami, FL – The 5000 Role Models of Excellence Foundation and Miami Dolphins hosted the Prestigious Annual Academic Signing Ceremony on Friday, May 18, 2018. Fifty-eight (58) Wilson Scholars signed scholarships to the colleges and universities of their choice. The program’s founder, Congresswoman Frederica S. Wilson (D-FL 24), shared, “When you look around, you will see that the 5000 Role Models is multicultural, multiethnic and the audience is. So it brings the boys together in their brotherhood. They’re part of the brotherhood. … We’re so proud to be partners with Mr. [Steven] Ross. He has stepped forward to let us know that he cares about the community, and especially he cares about the children in our community.” The program has awarded millions of dollars in scholarships since its founding in 1993. The event is one of two cornerstones of a long-term partnership with the Miami Dolphins, centering on social justice, education and police and youth relations. The second signature event is the Miami Dolphins and 5000 Role Models Police and Youth Conference, held this year in February 2018. In addition, the Dolphins will continue preexisting programs with the 5000 Role Models of Excellence Project and amplify new events. In all, these social justice community initiatives will impact more than 10,000 Role Models. 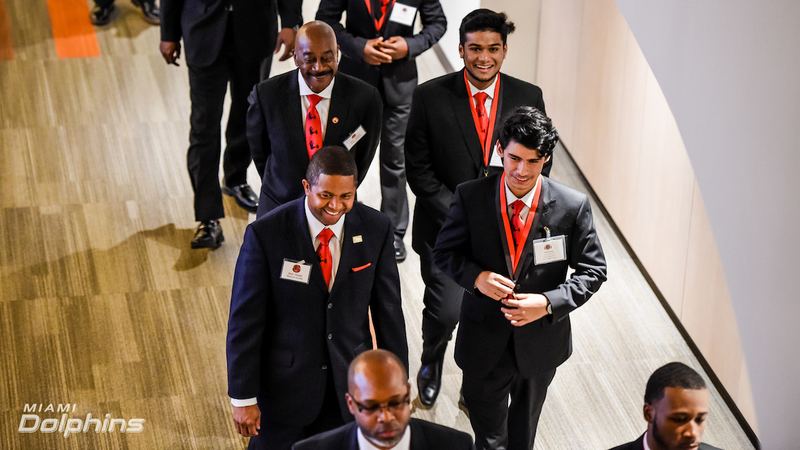 The Wilson Scholars wore their custom suits and signature neckties donated by Sean John and during the event, they received new laptops.